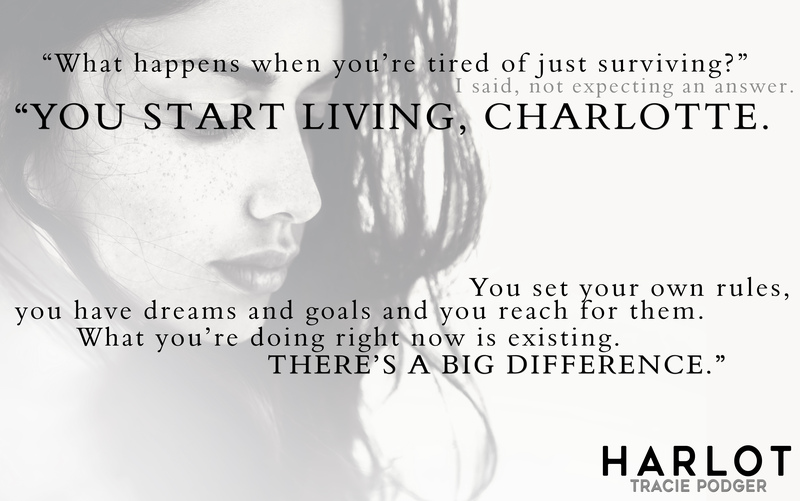 Review – Harlot By Tracie Podger – 5 Stars!!! All it took was one night for Charlotte to finally run from the horrendous life she was living. She is far from safe though. The sanctuary Charlotte finds turns out to be much more than she imagined. Charlotte has a love/hate relationship with the mysterious Beau. Will they open up to each other in time, or will it be too late? Tracie Podger has taken the Thriller/Suspense genre by storm! Tracie takes us the reader hostage and throws us into a world with no holds barred. She has a talent for giving us hints and clues to what the real story is behind the characters, and as the clues are revealed, it unlocks a whole set of new questions; that keep you hooked and poised till the very end. My heart completely broke for Charlotte, she had nowhere to turn and no one to turn too. I wanted nothing more than to torture the people who were destroying and torturing her. Deep down Charlotte was a caring and bright young woman, who was desperate to have some kind of caring family again. Beau was mysterious, strong, a complete enigma. His dark, brooding personality only added to his charisma. It’s clear he holds many secrets; many that trouble him every day and some that have shaped him into the man he is. Harlot is another piece to the bigger puzzle of Gabriel and Deadly. Although each book is a standalone, they all connect to a much bigger picture. One that is becoming darker and more thrilling with each added piece. I love how Tracie Podger has written a group of stories, that we as readers can enjoy as individual stories or delve into them all and discover a more complex and shadier hidden story.